Victoria’s retail market has remained Australia’s strongest performer despite data indicating that the retail trade has slowed nationally. Knight Frank’s July report on Melbourne retail revealed vacancy across Melbourne’s prime retail strips decreased for the first time in two years as the growing residential population continues to drive demand, particularly for food retailing. Victoria’s economy continues to outperform the national average, with State Final Demand growing at a pace of 4.5% year-on-year to March 2017. Despite showing signs of slowing nationally, retail trade in Victoria continues to outperform other states. Australian Bureau of Statistics data indicated that retail turnover in Victoria in the 12 months to May 2017 increased by 5.1% compared with 4.2% in the preceding 12 months. Retail trade reportedly totalled $6.4 billion in the 12 months to May 2017, up from $6.1 billion in the preceding 12 months. The increases was largely attributed to pharmaceutical, cosmetic and toiletry goods (14.9%), footwear and other personal accessory retailing (14.3%) and furniture, floor coverings and textile goods retailing (11.4%). The latest ABS census results showed that the Victorian residential population increased by 10.7% in the five years to June 2016 to reach 5.9 million. Retail turnover and retail trade in Victoria continues to be underpinned by strong residential population growth. The vacancy rate across Melbourne’s 11 prime retail strips declined for the first time in two years, falling from 8.4% to 8.0% in the 12 months to July 2017. Vacancy levels decreased across eight out of the 11 prime retail strips compared with six in the preceding 12 months, but the Victorian numbers remain above the long-term average of 8.6% and ranked as the second highest across all of Melbourne’s prime retail strips. The Victorian economy is forecast to continue to strengthen over the medium term, with State Final Demand growing at an average pace of 2.9% between 2017 and 2021. Retail turnover growth is forecast to increase at an average of 3.2% during the same period. 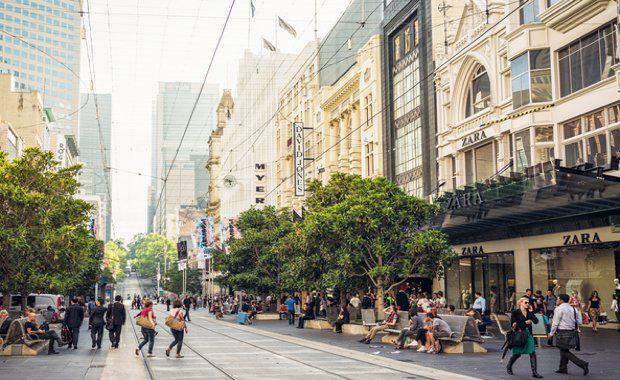 The growing residential population will continue to boost retail trade, particularly food retailing, with a number of residential and mixed-use developments earmarked along Melbourne’s prime retail strips. Numerous retailers along Melbourne’s prime retail strips have gone into administration over the past 12 months, including Topshop, Marcs and Pressed Juices, highlighting the increasingly competitive Australian retail market. In addition, the upcoming arrival of Amazon will further add competition.